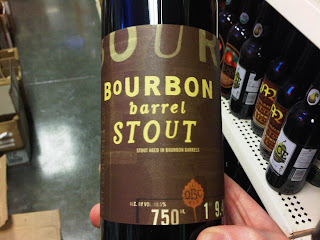 First we have the Bourbon Barrel Stout, one of the fancy cork-topped limited releases that Odell introduced in place of the imperial six-packs. This 750 ml offering was made public back in August, but our batch must have been hand delivered from the folks in Ft. Collins, CO, since we are just now getting it. It's the same old story for us here in Albuquerque, but since this is a 10.5% ABV stout, the age can't hurt it a bit. Fresh bourbon barrel aged anythings are usually too hot when fresh anyway. $14.99 gets you this nice Christmas time sipper to give to me. You say I deserve something pricier? No, really? ME? Ok, then, why don't you go big and get me Woodcut #03, the third (duh) release in the Woodcut series. 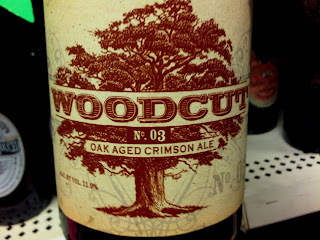 The "Woodcut" stands for the fact that all the beers in this limited series are aged in oak barrels. Pricewise, if Woodcut were an ice cream, it would be considered super premium. A 750 ml retails for $25.99 (!!! ), but you know I'm worth it! #03 is an 11% ABV American Strong Ale, described by Odell as a "Crimson Ale", its color coming from the Crystal, Cara, and Munich malts used in the brew. I am eagerly anticipating your gift, and I thank you all in advance! Hey man I got you a good beer on it way. See ya at the end of the week. Happy Day After Repeal Day!